We’d love your help. Let us know what’s wrong with this preview of A Spring of Weddings by Toni Shiloh. To ask other readers questions about A Spring of Weddings, please sign up. I enjoyed this story. I loved both Nik and Lily, and it was neat (and made for a nice change of pace) to read a story where the characters are already engaged and planning their wedding at the very start of the story! I was fascinated by the details and history of Nik's culture, especially since it's a culture that I know very little about, I loved that those details were included! I related to Lily quite a bit. I couldn't believe some of the things that Nik's mom said and did to Lily! While I was glad that she ultimately did change her tune, it didn't really seem plausible to me how quickly she became nice, I realize that as this is a novella the word count was limited, but I found myself thinking that I wouldn't have trusted her when she made such a complete one eighty. A Spring of Weddings is delightful. Two beautiful novellas encased within one book. Although they are both stories of love, they are entirely different from each other ... in an interesting way. Carly and Damien have been asked to stand in as proxy bride and groom by their best friends Brenda and Adam. This ‘proxy wedding’ was to take pla A Spring of Weddings is delightful. Two beautiful novellas encased within one book. Although they are both stories of love, they are entirely different from each other ... in an interesting way. Carly and Damien have been asked to stand in as proxy bride and groom by their best friends Brenda and Adam. This ‘proxy wedding’ was to take place in beautiful Montana, so lovely a place that almost anything could happen. Maybe, two strangers could fall in love. But the road wasn’t meant to be easy, both Carly and Damien had their own demons and fears in life. Would they be able to overcome these fears and superstitions, and go on to live a happy life together? What a beautiful story. Toni Shiloh, you had me at the first line. Yes, I am willing to concede that there was a fair amount of predictability, but if there is to be a happy ending, and I just love a happy ending, then some things are slightly predictable. This was a gorgeously, romantic (sorry about the adverb … not! I love adverbs) story. My heart was a-flutter right the way through. Adequate suspense was provided … was it ever! I couldn’t stop turning (clicking) the pages. Conflict was present in all his shapes and forms. You were kept wondering right until the end … “what is going to happen?” Now, for those who haven’t read this beautiful story, please don’t assume that ‘happy ending’ means ‘girl gets boy’ or vice versa. These two characters are so incompatible in so many ways. Want to know what happens? Hear all the gossip? You’ll just have to read the story. It was obvious to both of them that they were totally infatuated with each other, and those strong feelings had turned into love; but would the differences in culture, upbringing, and individual personalities, allow them to be together forever? More importantly, would Nik’s very traditional Samoan parents ever be able to accept Lily as a member of their family? Lily was definitely not the ‘good Samoan girl’ that tina had expected Nik to choose for his bride. I loved this gorgeous story. I found this story to be going in almost the opposite direction to the first, within this beautiful book. It was New Year’s Eve, the most romantic time of the year, and a time for new beginnings. Two young people were in love, what could possibly go wrong? Suspense held onto me right throughout the story, constantly hoping with all my heart that everything would be okay, differences could be settled, misunderstandings forgiven, and a love so perfect, gifted from God, could become reality. I loved the imagery throughout, whether on a beach or a backyard deck, the scene was perfectly set. I could visualise myself being with each of the characters as they went through their own private turmoil, and when they were interacting to find solutions. The main characters were very well rounded and I feel that I know each of them personally. The inclusion of a glossary of some Samoan words was delightful. Those beautiful words added to the intensity of the romance. Several issues to do with intercultural marriage were tackled successfully. Nik and Lily won’t go through their married life problem free, but who does? There will always be some issues and conflicts to be dealt with, as with all marriages, but especially when two cultures join. I loved the fact that they both knew and loved Jesus. This will be the saving grace that keeps them together. If you are looking for some lovely romance to while away a few hours, then I would highly recommend that you buy “A Spring of Weddings”. Both stories are superb, suspenseful, well written, and full of good, clean, innocent love. What an enjoyable read. The two novellas were so very different, yet both were full of hope, love, and joy. What more fun could I reader have than "watching" two friends stand-in as wedding proxies; or learning to appreciate and respect a culture that is so very different than yours, yet not all that different when it comes to ones faith, values, love, and the meaning of family. Grab this one for a joyful, lighthearted and meaningful read. You certainly can't go wrong with this novel or with either of these authors. What a wonderful premise for a novella. Having your best friend stand up as you (they would be your proxy) so that you can be legally married!! Except in this case, the proxy is for both the bride and groom...and has to take place in Montana. I loved the two main characters: Carly and Damien. At first they seem like such opposites, but they come to realize that they have a great deal in common, enjoy one another's company, and have a way of bringing out the best in one another. They are fun, yet sometimes serious, individuals who have similar yet different backgrounds and have based many of their life choices on their past. What they learn in the drive from CA to Montana and back is that their life choices may have been made for some of the wrong reasons and trusting in God has no limitations. What an enjoyable and engaging read. I loved the way the author used the characters to demonstrate certain aspects of faith (or lack of) in oneself and in God. She picked a great plot line that really hooked the reader right from the start, and two wonderful characters in Carly and Damien. An absolutely fun, enjoyable, engaging, and wonderful novella. Melissa Wardwell does something very different in her novella. She brings together a Samoan man and an English woman. Background wise each individual has grown up so very differently. Yet, despite all of the differences, Nik and Lily find what really matters to them most is being with the other. Nik has lived a few different places in his life, while Lily has never left Savanah. He has grown up in a large and loving family while she entered foster care at age 10. So when Nik's family arrives a few weeks before the wedding she is looking forward to be able to finally seeing what being a part of one is really like. Except she is in for a big surprise...as is Nik. I really enjoyed this novella for the relationship between Nik and Lily as it really demonstrates unconditional love. While the mother was very off-putting, she also taught a lesson to herself and to those around her that what you see is not always what is there. Unlike Nik, she is judgmental and forgets to put her son and his fiancée first, family first, and to release her negativity to God. Lily also teaches a great lesson by being honest with herself but also doing so with Nik's mother and showing how, with confidence and love...and God's guidance, people and situations can change. A great read and a wonderful blend of two cultures who have the same religious background. A more serious novella, of the two, it is enjoyable and full of so many messages: all from the heart. A Spring of Weddings is collection of two stories about, as I’m sure you guessed, Spring weddings. I don’t normally like Romance books, but there were a few things that made this collection special. The first story in this collection is “A Proxy Wedding” by Toni Shiloh. This was the first book of hers that I’ve read, though I like her blog. I have to say, the unique premise of this story caught my attention right from th A Spring of Weddings is collection of two stories about, as I’m sure you guessed, Spring weddings. I don’t normally like Romance books, but there were a few things that made this collection special. The first story in this collection is “A Proxy Wedding” by Toni Shiloh. This was the first book of hers that I’ve read, though I like her blog. I have to say, the unique premise of this story caught my attention right from the start. I didn’t even know what proxy wedding was, let alone a double proxy wedding. I don’t want to give away any spoilers, but there were definitely a few surprises in this cute, well planned tale. “Hope Beyond Savannah” is the second part of the collection and was written by Melissa Wardwell. It was also my first time reading anything by this author. It was an interesting story, but in my opinion, things happened so fast without enough time for character development. Maybe it would have been better as a full length novel. I really appreciated the multicultural aspect of this story. I should also mention that if you don’t like to read about lots of kissing and physical affection, this isn’t the story for you. It felt like, “ugh, more kissing,” but as I mentioned before, I don’t really like romances. I still found the story interesting, though. And I felt for the main character, Lily. Poor thing! Overall I would definitely recommend this book for a quick, entertaining read. These two stories couldn't be any sweeter! I loved them both equally, no need to choose a favorite. The overall theme in both was love conquers all. Not just our love for each other, but God's love as well. Both of these authors do a fantastic job in showcasing God's love and message in their stories which is why they are such a delight to read! Let's start with A Proxy Wedding. First of all, I have never even heard about this so it was an interesting read! Is this real? That's what I was thinkin These two stories couldn't be any sweeter! I loved them both equally, no need to choose a favorite. The overall theme in both was love conquers all. Not just our love for each other, but God's love as well. Both of these authors do a fantastic job in showcasing God's love and message in their stories which is why they are such a delight to read! Let's start with A Proxy Wedding. First of all, I have never even heard about this so it was an interesting read! Is this real? That's what I was thinking the entire time I was reading. It sounds so weird, but such a fantastic way for these two people who could not be more opposite to come together. But I loved the way the author brought them together, and forged this unheard of relationship. Rather than their differences being a hindrance, they proved that sometimes differences can really be complimentary. In Hope Beyond Savannah I was immediately drawn to the heritage of Nik. But the highlight of the story was when his tina (mother) came to town. I chuckled pretty much every time she was in a scene. She's like that mother-in-law that every bride dreads and I felt so bad for Lily. But I think the author did a fantastic job in writing Nik's reaction to every scene. It was the exact opposite of what I thought it might be (based on previous stories I have read with situations like this), and I found that extremely refreshing. Also, hats off to the author for the research in Nik's dual heritage. It was a delight to read! I received a complimentary copy of his book from the publisher. I was not required to write a favorable review. All thoughts and opinions are my own. Hope Beyond Savannah is also the first book I've read by Melissa Wardwell. This one a bit more difficult to read than Toni's, as I was in Lily's position where I was the girl my then boyfriend wanted to marry and his mom treated me every bit as badly as Nik's mother treated Lily. I do admire Nik for standing up for Lily. "I was provided a free copy of this book. All opinions are my own." That done, A SPRING OF WEDDINGS contained two stories by two new-to-me authors. I enjoy reading contemporary romances, and these were sweet. They are both clearly Christian, but gentle with the faith message. If you like contemporary romances, you will want to read this collection. Both of these were good, quick reads. Neither is a story you will want to stop and put down but rather sit down and read to the end! In a Proxy Wedding, we meet Damien and Carly. The two are both good at heart but opposites in personality. Though they are different, there are similar outlooks and I enjoyed seeing the attraction and personalities grow/change. In Hope beyond Savannah, it is another opposites story but on a wider scale (in my opinion). Lilly and Nik are together and the issue they Both of these were good, quick reads. Neither is a story you will want to stop and put down but rather sit down and read to the end! In a Proxy Wedding, we meet Damien and Carly. The two are both good at heart but opposites in personality. Though they are different, there are similar outlooks and I enjoyed seeing the attraction and personalities grow/change. In Hope beyond Savannah, it is another opposites story but on a wider scale (in my opinion). Lilly and Nik are together and the issue they mainly have is his mother. The author does a good job with some tricky subjects and handles them with care. I hadn't considered the issues people still face in relationships like this but this author showed that this type thing still happens and how God is the one people answer to. Both stories have faith woven through and I really enjoyed them. 4/5 for me. A Spring of Weddings is a delightful pairing of two contemporary romance novellas. “A Proxy Wedding” is the first Toni Shiloh book I’ve read, and I was not disappointed. The plot idea is clever – the best man and maid of honor must step in and get married on behalf of the bride and groom – and the characters are realistic and believable. Their cross-country adventure was fun, and I enjoyed riding along with Carly and Damien. “Hope Beyond Savannah” by Melissa Wardwell is an exploration of the cha A Spring of Weddings is a delightful pairing of two contemporary romance novellas. “A Proxy Wedding” is the first Toni Shiloh book I’ve read, and I was not disappointed. The plot idea is clever – the best man and maid of honor must step in and get married on behalf of the bride and groom – and the characters are realistic and believable. Their cross-country adventure was fun, and I enjoyed riding along with Carly and Damien. “Hope Beyond Savannah” by Melissa Wardwell is an exploration of the challenges faced by a bi-racial couple. Well-researched, the story weaves information about the Samoan culture in an interesting and natural manner. I appreciated the research notes provided at the beginning. I found myself rooting for Lily and Nik as they dealt with wedding jitters, difficult family members, and their own insecurities. A very enjoyable story. I received this book for free from Celebrate Lit Publishing, and a favorable review was not required. All opinions expressed are my own. I think this is the first thing I've ready by Shiloh. The first story is cute. It's a about a proxy wedding. That is something I already knew about, so I wasn't surprised at the premise. The story unfolded about like I thought it would, but it's still cute enough. The second story was fun, and snuggly, and made me want to cuddle up with my sweetheart. It's full of romance. While very opposite of each other in all kinds of ways, the things that matter the most are united in this sweet story of Ho I think this is the first thing I've ready by Shiloh. The first story is cute. It's a about a proxy wedding. That is something I already knew about, so I wasn't surprised at the premise. The story unfolded about like I thought it would, but it's still cute enough. The second story was fun, and snuggly, and made me want to cuddle up with my sweetheart. It's full of romance. While very opposite of each other in all kinds of ways, the things that matter the most are united in this sweet story of Hope beyond Savannah. I've read more than one book by Wardwell, and this author's writing style is really growing on me. These two enjoyable stories make for a fun, romantic read that will have you dreaming of spring weddings as well as God's love in a romance. This was two sweet modern romances. I'm always a sucker for happily ever afters. Toni Shiloh is a new to me writer. The plot was a fun twist and I really enjoyed the characters and the way the story unfolded. It was a predictable ending, but enjoyable nonetheless. Then we come to story number two. Melissa Wardwell took me on a 160 turn around. I really enjoy her writing style but this one blew me away. From interesting facts and research about a different culture to two night and day characters This was two sweet modern romances. I'm always a sucker for happily ever afters. Then we come to story number two. Melissa Wardwell took me on a 160 turn around. I really enjoy her writing style but this one blew me away. From interesting facts and research about a different culture to two night and day characters this was a captivating read. These two novellas were perfect to brighten my mood on a warm summer afternoon! If you need a quick read between heavier full-length novels, A Spring of Weddings is for you! A spring of weddings has two stories in it by two different authors. Both stories are delightful and very enjoyable. They are both centered around a wedding. The first one is by Toni Shiloh and I read another book of hers awhile back and remember really liking it too (so I guess you could say I have become a fan of her books now). Hers is a Proxy Wedding. Can you imagine asking your best friend to take your place and stand in for you at your wedding ? That is exactly what happens here but with i A spring of weddings has two stories in it by two different authors. Both stories are delightful and very enjoyable. They are both centered around a wedding. The first one is by Toni Shiloh and I read another book of hers awhile back and remember really liking it too (so I guess you could say I have become a fan of her books now). Hers is a Proxy Wedding. Can you imagine asking your best friend to take your place and stand in for you at your wedding ? That is exactly what happens here but with it comes some fun along the way for the two stand ins who have never met. Now the next story is by Melissa Wardwell and I don't recall having read any of her books yet. Hers is called Hope Beyond Savannah. This story involves a biracial couple and the difficulties that may arise when families have a hard time accepting someone different . This could be a hard topic but the story is really a sweet one. Would very much recommend A Spring of Weddings for a nice light read. "A Proxy Wedding": I had never heard of a proxy wedding and found it to be an intriguing idea (I had to look it up) I liked Carly and Damien. They both grew through the story and learned to trust God more. It is a novella, so things move fairly quickly, but with the epilogue being a year later, it helps to "slow things down". "Hope Beyond Savannah": This story was interesting in that the main characters were already a couple when the story started, so the story isn't a typical romance where we se "A Proxy Wedding": I had never heard of a proxy wedding and found it to be an intriguing idea (I had to look it up) I liked Carly and Damien. They both grew through the story and learned to trust God more. It is a novella, so things move fairly quickly, but with the epilogue being a year later, it helps to "slow things down". "Hope Beyond Savannah": This story was interesting in that the main characters were already a couple when the story started, so the story isn't a typical romance where we see them fall in love. The struggles come from the fact that Nik's mom is not very accepting of Lily. One thing that didn't seem realistic to me was Nik's mom mentioning that Lily would get fat as Samoans tend to be larger people and I don't think she would mind. But it was a minor bump. I liked watching Nik's tenderness with Lily and his love for her. Knowing someone from Samoa, it was fun to have a character from there. I enjoyed reading this story. What a fun collection of novellas! I have always enjoyed Toni Shiloh’s writing and the novella A Proxy Wedding in this collection is no exception. Even with the limitation on length, Toni Shiloh creates a believable and enjoyable premise and plot with two friends of prospective groom and bride participating in a proxy wedding. The characters Damien and Carly are multi-dimensional with past hurts that blockade possibility of a healthy relationship. Their conversation is real, their faith down-to- What a fun collection of novellas! I have always enjoyed Toni Shiloh’s writing and the novella A Proxy Wedding in this collection is no exception. Even with the limitation on length, Toni Shiloh creates a believable and enjoyable premise and plot with two friends of prospective groom and bride participating in a proxy wedding. The characters Damien and Carly are multi-dimensional with past hurts that blockade possibility of a healthy relationship. Their conversation is real, their faith down-to-earth and touchable. The lessons of life and faith that both Damien and Carly learn are universal for all of us. I would love to see this novella developed into a full-length novel. The novella Hope Beyond Savannah is the first from Melissa Wardell I have read. I enjoyed reading about the Samoan culture and language and how Nik and Lily meld their differences in culture, language, food, and background. Their love is based on their shared faith in God and their mutual respect and admiration for each other despite their differences. The writing is easy to read and the characters are lovable. The plot is well-developed though it’s a novella- length. I thoroughly enjoyed both of the stories and look forward to reading more from both of the authors. I honestly don’t think I could put better words to a review than Carrie from Reading is my Superpower already did! I loved reading Toni’s story especially. The whole wedding proxy idea is so thoroughly unique, and the chemistry between the pair as they trek to do this favor for their friends? Excellent. Two contemporary romance novellas with delightful characters with real life problems and flaws. These enjoyable fast-paced reads were hard to put down. A Spring Of Weddings has two delightful stories one by Toni Shiloh and one by Melissa Wardwell. They have similar themes but both are unique and wonderful warm reads that will speak to your heart. A Proxy Wedding by Toni Shiloh was the most delightful contemporary Christian romance. Such a sweet story with characters that warmed my heart. God was very much a focus. He could be seen in nature. Toni Shiloh's delightful descriptions gave me a 'view' of this landscape. Prayers to Him were very much a A Spring Of Weddings has two delightful stories one by Toni Shiloh and one by Melissa Wardwell. They have similar themes but both are unique and wonderful warm reads that will speak to your heart. God was very much a focus. He could be seen in nature. Toni Shiloh's delightful descriptions gave me a 'view' of this landscape. Prayers to Him were very much a part of everyday life. The novella dealt with the theme of past hurts. Anger at God for past situations featured. God can handle our anger. He wants us to be real with Him. And He wants a relationship with us. Fear was another theme. "Why did he let fear dictate his life?" God wants to take our fears and transform our lives if we will only trust Him. He does not want us to carry burdens that we were never meant to. "You've got to be exhausted because you're doing a job that was never meant to be yours." God is the God of second chances and new beginnings. Past mistakes need not be repeated. Our parents choices do not have to resurface in our lives. "Our parents choices do not determine our future." Trust God to give us new beginnings. A Proxy Wedding was absolutely delightful. It warmed my heart and made the world seem a better place. Hope Beyond Savannah by Melissa Wardwell is a charming Christian romance that really spoke to my soul. With its themes of love, family and belonging it was a really sweet story. The love just radiated from the pages. The novella explored the difficulties faced by a mixed marriage ranging emotions from anger to disappointment made for a rocky road at times. Would love really conquer all? God is love. We need Him in our lives. Including Him in our marriages will strengthen our union. Love is not just romantic love. Love is sacrificial. Love will do whatever love has to. In the difficult times sometimes the only thing we can do is pray... and trust God for the outcome. Family is important. Our upbringing can affect us into adulthood. Our past does not have to be our future. We need to trust God and others with our lives. The novella touches on the theme of childhood neglect resulting in foster homes and a search for love and a home. Hope Beyond Savannah was both a hopeful and a delightful read. I immersed myself in it and let Melissa Wardwell's words wash over me like soothing balm. Totally delightful pair of stories. A proxy wedding, and being able to read about a new culture to me, all in one book? As Damien put it ” Relationships are so confusing” and both these gals have written books that tackle real life moments, and give a beautiful faith boost to the confusing parts. Toni’s story about the proxy wedding was truly fascinating. I spent a ton of time looking up a proxy wedding definition. Never the less, this book may tackle a subject unknown to some, but it is full of sweet love, tender moments that lead A proxy wedding, and being able to read about a new culture to me, all in one book? As Damien put it ” Relationships are so confusing” and both these gals have written books that tackle real life moments, and give a beautiful faith boost to the confusing parts. Toni’s story about the proxy wedding was truly fascinating. I spent a ton of time looking up a proxy wedding definition. Never the less, this book may tackle a subject unknown to some, but it is full of sweet love, tender moments that lead Damien and Carly to true wedding bells. One thing about Toni’s writing is that the reader is never lost, I feel like a I traveling a path of words designed just for me, to lead me to the perfect ending. I thought that it was unique to have a romance story built this way, and it certainly kept me hoping for love. Toni is a modern day Christian romance author, truly, I am still reeling from the proxy wedding idea, I mean it’s crazy yet wonderful. It is a topic that can be tough to tackle, but like all her books Toni handled it with grace and faith. Trust me this is story that will grab your attention, then stick with you long after the end. Sometimes you read books that you fall in love with, and with reveiwing it's often pretty hard when you read a book and the love just didn't click. Maybe I was being a little to harsh...I don't think I was. I'm not normally like that. I just didn't enjoy myself while reading it. For you, it may be different, but while I read it I couldn't stay enthralled in it like I could other books. A Spring of Weddings isn't getting a five star rating from me I am sorry to say. I know authors work doubly ha Sometimes you read books that you fall in love with, and with reveiwing it's often pretty hard when you read a book and the love just didn't click. Maybe I was being a little to harsh...I don't think I was. I'm not normally like that. I just didn't enjoy myself while reading it. For you, it may be different, but while I read it I couldn't stay enthralled in it like I could other books. I know authors work doubly hard to make sure their readers fall in love with the characters, storyline, and all the other things involved in a book so giving a review that is more negative than positive is something I hate doing. The reason for my dislike of this book has nothing to do with the authors and everything to do with the storylines. The first short story, A Proxy Wedding, didn't have the oomph to make me fall in love... I had never heard of a proxy wedding before this so I was expecting something different and exciting, but the story seemed too rushed. Meet each other, fall in love, fight, fall back in love, etc... it was very traditional. If you're going for traditional than this storyline is perfect for you. But I get a little tired of the same ol' same ol'. The second story, Hope Beyond Savannah, was a little less traditional, but it was also more right before the wedding (they were already engaged). One main thing I didn't like about both books was that I learned more about the characters on the pre-read (I can't think of the right word right now...) on the back of the book than I did in my entire reading of the short stories. These authors have created a lovely pair of unique and especially creative love stories which are sure to delight readers drawn to this genre. A real 5-star winner for each story and both authors!! This story’s premise is truly unique - an actual proxy wedding! What? How? Who? With such an intriguing storyline, you’ll be brought immediately into the lives of these characters and how they are drawn together in a most improbable way. Shiloh is known for her stories of imp These authors have created a lovely pair of unique and especially creative love stories which are sure to delight readers drawn to this genre. A real 5-star winner for each story and both authors!! Shiloh is known for her stories of improbable love that blooms and grows and faith that triumphs despite challenges. A proxy wedding is a real thing but I sure hadn’t heard about it before reading this sweet story! In this faith-filled multicultural love story, Melissa Wardwell offers her readers an opportunity to discover more about Samoan language, customs and traditions. The soon-to-be-wed couple must trust God and walk in faith when their choices are questioned and their future together seems shaky. Love triumphs but not before this special couple must walk through adversity that serves to strengthen the bonds of their God-ordained union. Both of these authors are new to me, but they are truly talented! I wasn’t sure what to expect when I started reading these two sweet stories, but I was pleasantly surprised. I was so glad that I had the chance to read these captivating stories of love and hope. The characters in both stories quickly weave their way in to your heart to stay forever. Damien, Carly, Nik and Lily were complex and beautifully created! Watching these four characters grow in love and become just who God intended them t Both of these authors are new to me, but they are truly talented! I wasn’t sure what to expect when I started reading these two sweet stories, but I was pleasantly surprised. I was so glad that I had the chance to read these captivating stories of love and hope. The characters in both stories quickly weave their way in to your heart to stay forever. Damien, Carly, Nik and Lily were complex and beautifully created! Watching these four characters grow in love and become just who God intended them to be, was refreshing for me! The authors throw in a few laughs here and there, making this an unputdownable read for me! I definitely give these beautiful, faith filled stories 4 stars. From start to finish of this fast paced, heart capturing story, I felt I was among friends, not characters in a simple book. These authors are truly great at what they do, and I am highly anticipating the next amazing read from these two lovely ladies! Well done! Two good stories in one book but very different from each other. The first one called a Proxy Wedding is definitely different. Carly and Damien who never met before is asked to stand in for their friends to get married but have to travel to a different state that does proxy weddings. They have a long way to drive together. I really enjoyed this different wedding story. The second is about Lily and Nik planning a wedding in a short time and have a hard time with Nik's mother. I felt bad for Lily at times. Will things work out in the end? A very interesting story. A short and sweet collection of unexpected love: One story is of a soon to be daughter-in-law and her fiance's mother and the other is about a couple doing a favor for their friends. June is usually the time for weddings but in this collection Spring is the time for love. I loved both stories and quickly Was involved in the storyline. A Proxy Wedding - Carly wasn't too thrilled to go on a car trip with a stranger. But this car trip changed her life. Hope Beyond Savannah- Lily adored her fia A short and sweet collection of unexpected love: One story is of a soon to be daughter-in-law and her fiance's mother and the other is about a couple doing a favor for their friends. Hope Beyond Savannah- Lily adored her fiance. But his mother was hard to get a long with. Will the marriage be called off? I loved that this story involved a family from Samoa. Two very sweet, unique stories of love and weddings. Each story tells of a couple and their path to marriage. Ups and downs, family opinions, cultural differences, helping friends and so much more is told in these special stories. I enjoyed reading A Spring of Weddings and look forward to reading more by these authors. I was given a copy of this book by the authors and publisher and this is my personal honest opinion. These two stories are really nice and sweet stories. Obviously these stories are about weddings but they are as different as night and day. In "A Proxy Wedding" Carly James and Damien Nichols are complete strangers and completely opposites, and are asked to be stand-ins for their best friends at a proxy weddings. While reading "A Proxy Wedding" I thought what a cute story and then I thought I am going to look on google and see if there is such a thing as a proxy wedding and THERE IS, BUT OF COURSE These two stories are really nice and sweet stories. Obviously these stories are about weddings but they are as different as night and day. While reading "A Proxy Wedding" I thought what a cute story and then I thought I am going to look on google and see if there is such a thing as a proxy wedding and THERE IS, BUT OF COURSE IT IS A LITTLE DIFFERENT THAN THE STORY, it is actually done on online. See, reading helps us learn new things! In "Hope Beyond Savannah"the mother of the groom isn't really fond of the bride to be. Can Lilly change her mother-in -law to be mind or will she call off the wedding because she won't come between mother and son. This story is really a story about what love is and what love does! 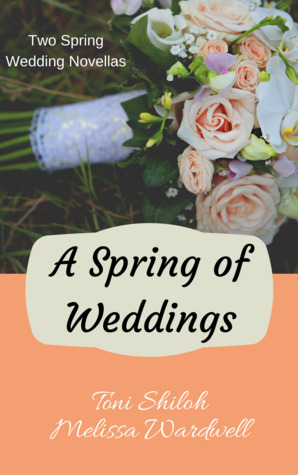 I am giving "A Spring of Weddings" by Toni Shiloh & Melissa Wardwell five stars! I was given a complimentary copy by Celebrate Lit. The opinions expressed are my own. “A Proxy Wedding” by Toni Shiloh is about two people asked to stand in as proxies for their best friends who are in the military (separate bases) and want to get married. It’s not really a marriage of convenience tale but it has a similar feel – so of course I loved it! Carly and Damien are polar opposites, yet deep inside they’re really a lot alike. Watching them fall in love is romantic and fun (though not without its speed-bumps) and I appreciated the epilogue at the end which kept the story from being too “instalove”. “Hope Beyond Savannah” by Melissa Wardwell revolves around a biracial relationship between a Samoan man and an American woman. They are already in a serious relationship, so this novella isn’t about their romance as much as it is about their love for each other in the face of adversity. Adversity that comes in the form of a less-than-welcoming mother-in-law (who needed a good pursewhomping). Now, don’t get me wrong – it IS a romantic story – lots of kisses and sweet moments. But the focus is on how they navigate life after they’ve fallen in love. This is a heartwarming novella with a message that everyone needs to hear. Bottom Line: Two sweet stories of love and romance – and of course weddings! Both novellas have unique premises and are well-written and engaging. Their characters are polar opposites, differences which do cause some bumps along the way, but the power of love – and forgiveness – goes a long way.